You cannot tell the quality of a piece of tape media by looking at it. It’s easy to see the price tag, impossible to see the nine critical factors that determine whether one tape is more reliable than another. 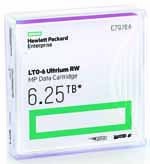 Here’s why HP LTO Ultrium media is so outstanding. Low Error Rate - Error rate is the fundamental measure of whether a tape is performing properly. HP materials and assembly ensure you get the lowest error rate each and every time you load the tape. Recording Performance - Low error rates mean better recording performance. That’s because HP quality controls scrutinize the massive rolls of tape, miles long, as well as their smallest ingredients, just microns in size. Tape Edge - One of the most common issues with poorly manufactured tapes is edge damage. HP uses computer-guided slitting machines and laser targeting to ensure the cleanest and most reliable tape edge. Abrasiveness - If the tape surface is too rough, it can wear the drive head down like sandpaper. But if it’s too smooth, then the signal is too weak to record properly. With HP, it’s just right. Coating - If the surface of your media is uneven, the effect on your tape drive is like driving down a road with gigantic speed humps. Not only is this bad for recording data, it doesn’t do much for the life expectancy of your tape drive. HP’s advanced coating technology ensures your tape drive has the smoothest ride, all of the time. Binder and Lubricant - Tape media is made from metal particles coated in a special paint called a basefilm. If the consistency of the basefilm isn’t right, then the particles will be unreadable and no recording can take place. This is one of the critical areas of manufacturing because there are billions upon billions of particles on every LTO tape. Servo Writing - Servo tracks are like runway lights for the tape head, guiding it along the correct path to ensure it records safely. No prizes for guessing what happens if the runway lights go out. HP servo testing and quality controls make sure they don’t. 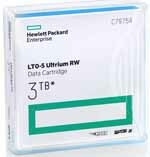 Archival Stability - HP LTO Ultrium media can last for at least 30 years if properly stored. To ensure this happens, the tape is treated with a suit of armor coating using a process called ‘passivization’ to make it tough enough to withstand the passing years. All of the above - At every stage, over-correcting one parameter has a knock-on effect of negatively impacting a different aspect of the recording process. Successful media manufacture is the ability to keep many complex variables precisely aligned all the time. It’s because HP tracks every aspect of media and drive performance that HP LTO Ultrium is made to be different and made to be better!